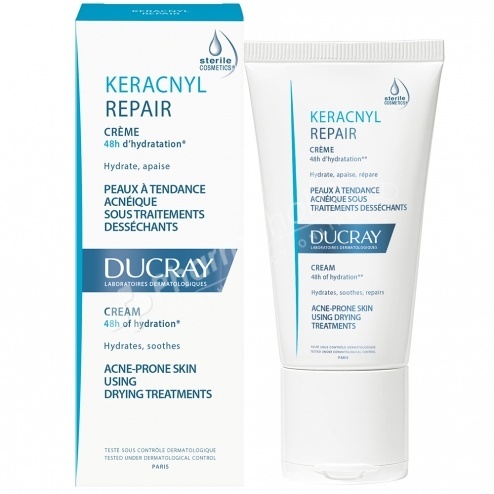 Ducray Keracnyl Repair Cream moisturizes, soothes and repairs acne-prone skins dried out by medicine treatment. Ducray Keracnyl Repair Cream 50ml moisturizes, soothes and repairs acne-prone skins irritated and dried by medicine treatments. The hydroxydecine stimulates the synthesis of natural factors of hydration (NMF) and helps the skin to react in a better way face to the negative effects of free radicals. The Vitamin D allows to rebalance the cutaneous hydrolipidic film. Sensations of itching and irritations are reduced. Soothed, the skin is moisturized recovers softness and suppleness rapidly and durably. High tolerance. Clinically proven efficiency in association with anti-acne oral treatments. Dermatologically tested. Paraben and preservative-free. Hypoallergenic. Non comedogenic. Apply on face once or twice a day. Water (Aqua), Glycerin, Mineral Oil (Paraffinum Liquidum), Glyceryl Stearate, Peg-12, Butyrospermum Parkii Butter, Dimethicone, Microcristalline Wax (Cera Microcristallina), Palmitic Acid, Stearic Acid, 10-Hydroxydecenois Linoleate, Glyceryl Linoleate, Glycine Soja (Soybean) Oil, Glycine Soja Oil, Paraffinum, Sodium Acetate, Tocopherol, Triethanolamine.